First and second year adult and children's nursing students from London South Bank University attended Heroes at Highclere on Sunday 3 August 2014 to teach visitors vital lifesaving resuscitation skills. 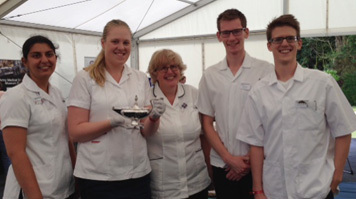 Nursing students Sarah-Jane Chal, Sarah Jesson, Myles Harris and Joel Williams attended the day at Highclere Castle, famously known as the 'home' of television drama Downtown Abbey. The event, Heroes at Highclere Castle, was held in commemoration of the 100th year anniversary of the First World War and raised money for humanitarian and Armed Forces charities. Our students alongside Pro VC/Dean of Health and Social Care, Professor Judith Ellis MBE and Senior Lecturer Lorraine Highe, taught resuscitation skills to hundreds of visitors of all ages with Highclere Castle making the perfect setting as during the First World war it was used as a healing house. The public were eager to learn the basics and keen to tell us some of their past experiences with it. It was also interesting to see the variety of people that participated and very satisfying knowing that despite the age ranges, 7 year olds to 70 year olds might some day save a life following our teaching sessions. Find out more about our nursing courses using our course finder.